The Carlton and South Melbourne teams took to the field in 1907 sporting new club uniforms. The lace up top was being slowly faded out at both clubs. A number of the Carlton players now wore an all blue jersey, while the Southerners traded in their red and white stripes for an all white jersey with a red sash. At the close of the home and away games, and after the sectional rounds, Carlton sat on top of the ladder two games clear of South Melbourne. St.Kilda would be making its first appearance in the finals after finishing in third place, while Collingwood took up the final spot in the top four. 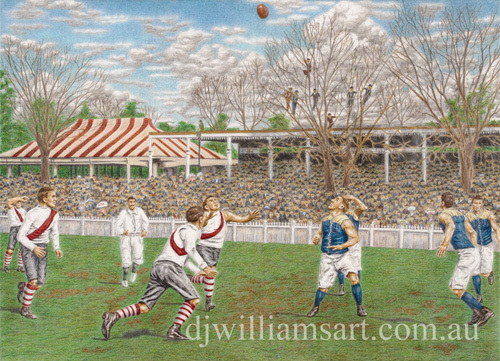 So it was that the season's two top teams would meet in the 1907 Grand Final. Though Carlton would go into the match as favourites, a swell of support surrounded South Melbourne's chances of causing an upset, for in their head to head battles throughout the season, South had the upper hand winning two of their three encounters. More than 45,000 people passed through the gates at the MCG on September 21 expecting to witness an epic encounter. The umpire for the match was former Collingwood premiership captain, 'Lardie' Tulloch, who had been the man in charge for each of the two previous semi-finals. When he bounced the ball in the middle to start proceedings he set in motion a Grand Final worthy of the crowd's high expectations. Goals were at a premium in the hard fought battle and when the bell sounded to signal the end of the first quarter the teams had kicked 1 goal apiece and were separated by just 1 point. To the delight of the crowd, the second quarter produced much of the same exciting football that had been a feature of the first term. At the bell, Carlton had a slight advantage over the Southerners and went to the dressing rooms at half time with a narrow 7 point lead. The third quarter was much in favour of the Blues. The Carlton men played a solid game in the ruck and denied the Southerners of their ability to run the ball into the open spaces. The result being that Carlton kicked 2 goals for the term to South Melbourne's 1 and went to the ¾ time huddle in front by 15 points. The match was far from over, however, and there were few people prepared make any early declaration of a Carlton victory. Their hesitation was well-founded as South Melbourne mounted a solid challenge in the final term. The Southerners were able to get the ball clear of the crush on several occasions and run wide along the wings. Their spirited performance saw them kick the first two goals of the quarter to take the team within 2 points of the lead. From there, the Carlton defence held firm under the relentless pressure and denied South Melbourne of any chance of adding to the goal tally. The Blues slowly regained control, and though they were unable to send the ball between the uprights, they managed to add several behinds to their score and at the final bell were out in front by 5 points. For the winners, Johnson, Flynn, Jinks and Gotz were amongst the best players. South Melbourne's best came from Callan, Ricketts, Casey and Belcher. Topping kicked 3 goals for the Blues, while Strang was South Melbourne's leading goal kicker with 3 goals of his own.